Great Snooper is an application written by ToOMiToO to connect to the WormNet server of Worms Armageddon. You can chat, enter games and even host with it. It has a very wide variety of features to make it easier and more convenient to use WormNet without the game. It requires Microsoft .Net Framework 4.0 or greater to be installed on your computer. You can use the latest version of .Net Framework because it is backwards compatible. I have always wanted to make a snooper for Worms: Armageddon since I have tried out ProSnooper 2. I wondered how it works and it was a great challenge for me to see whether I can write it too. After 2 and a half years studying programming at the University I managed to get the knowledge to write such a program. After Christmas 2013 I have got some free time and I determined to start coding it. Another motivating factor was that when I started to make this application there was no snooper program that I liked: ProSnooper 2 was kind of outdated and The Wheat Snooper was not working the proper way (however it is fixed now). When I make something then I like to make it as good as I can. It was with this snooper too, the most important thing that I wanted was that it should work as much the proper way as it is possible. And here comes the part where I would like to say thank you to CyberShadow, Deadcode, StepS, GreeN and all the people in #worms channel who has helped me a lot understanding how the online part of Worms: Armageddon works. The first version was released at 20 February 2014, but it had some bugs such as not working on Windows XP and not so good design. 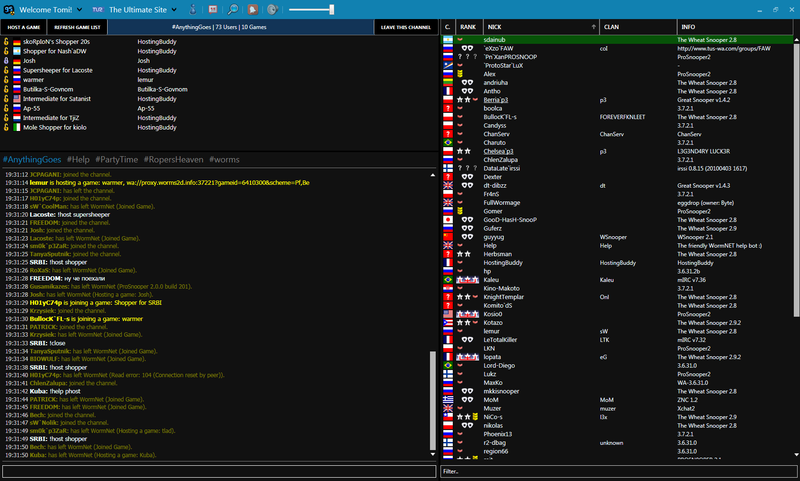 The first stable version (v1.2.0) came out 4th April 2014 which had a new desing, auto-updater feature and was already running on Windows XP too. On 2nd September, 2014 v1.3.1 was released which was stable and people started using it. It was up for almost a year long, but it had some little bugs and some requests arrived from users, so new update was started to develop. On 25th February, 2015, just after the snooper became 1 year old, version v1.4.2 was released, which was a totally rewritten, had tons of bug fixes, new, unique features (conversation, notificator, #worms channel). On 30th December 2015(?) v2.0 was released. The development of this version I started in March 2015. The application was rewritten from the start. A lot of bugs had been fixed, new features - such as multi-language support, new WormNat2 support, new Notificator, alternative WA.exe support, etc - had been added. How to open private chat tab? There are two methods for this: you need either double click the user in the user list or right click on it and select 'Chat with this user'. How to close private chat tab? You can do this 3 ways: use middle mouse button click on the tab header or right click on it and select 'Close' or press CTRL + W (like in browsers to close a tab). What means the color of a private chat tab header? Green means that the user is online, red means that the user is offline and yellow means that the user may not be online. The last state can happen when you and the user you are chatting with don't have any common channel. How can I filter by ranks or country if I don't know it's name? You can find out the name of a country or a rank if you drag your mouse over its picture. How can I open News window? News window will be opened automatically when there is a new item you haven't seen yet or you can open it from the main menu or by typing the command '/news' into the message box field. Can the snooper close itself when I join a game? There are 4 ways to join a game. You can see these options by right clicking on a game in the game list. When you choose 'Silent join' then the snooper will not send an action message that you are joining a game. There are two options you can choose to join a game and close the snooper (with or without sending the action message). Are there any other shortcut keys? Yes, you can navigate between tabs using Alt + Right or Alt + Left keys, and you can access filter fast by using the CTRL + F keys. Why are the name of some users underlined? That's because they are using the TUS login feature. With that feature clan name and user rank are loaded from the TUS database so they are correct. How can I find out the TUS nick of an user who is logged in by TUS login? Right click on the user in the user list and there you can check his/her TUS profile.